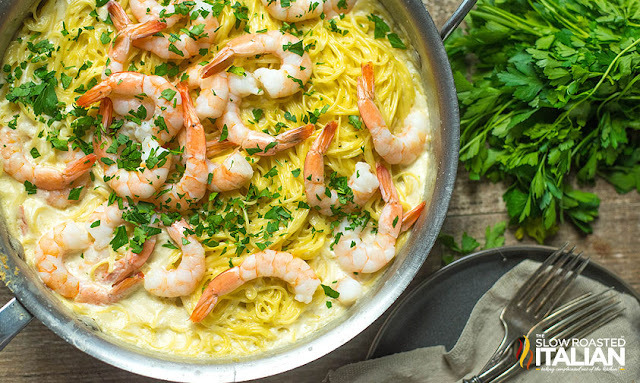 One-Pot Creamy Garlic Shrimp Pasta recipe is the stuff that dreams are made of, and the fact that it’s all in one pan makes it even better! 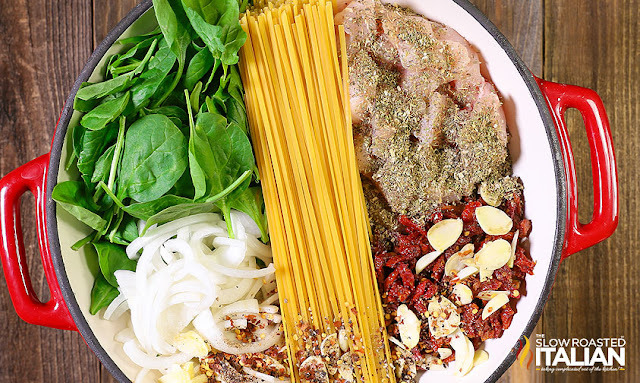 I’m Jacqueline, and I blog over at Go Go Go Gourmet- my mantra is all about “less effort, more taste,” and I have definitely achieved that with this incredibly simple, but absolutely delicious pasta dish that is a guaranteed family dinnertime hit. I’m so happy to be bringing my recipe philosophy over to my friends Donna and Chad here at TSRI! I have been a seafood lover for about as long as I can remember. When I was younger and would go out to dinner with my parents, my dinner of choice was almost always a shrimp cocktail. As I got older, my love of all things seafood grew, which is equaled by two things- an affinity for all things pasta and a hatred of doing dishes. This creamy garlic shrimp pasta hits it out of the park for me- a luscious creamy cheese sauce develops after cooking pasta straight in milk, cream, and water. No roux needed here! The amount of liquid that you use in this will depend on how fast your pasta cooks. I started off with 1 1/2 cups of each liquid, but I ended up adding another cup and a half when I stirred in the Parmesan to get the dish creamier. Add milk or cream until you get the texture that you prefer- thicker vs. thinner. 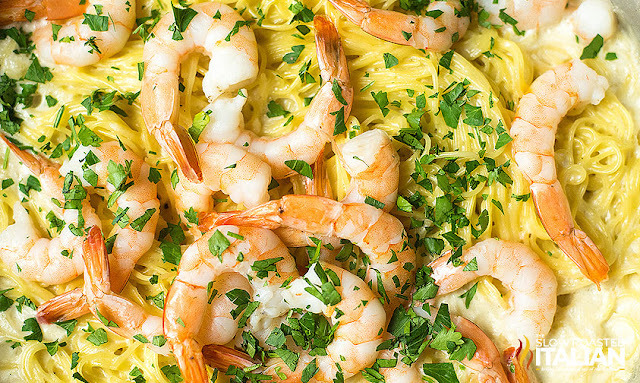 You can substitute the shrimp in this recipe if you prefer- rotisserie chicken would be outstanding. The amount you choose to put in is also flexible and entirely up to you! Wide Shallow Pan - a 4-quart braiser is one of my favorite pans. It is wide and shallow and perfect for one-pot recipes! Using a wide pan gives more surface area so your pot will heat more evenly and cook faster. Garlic Press-One of my moist used kitchen tools! I received mine as a gift years ago and I can't imagine why I never had one. It minces garlic with one squeeze, with the peel still on! Check out more of our favorite one-pot recipes: Click on the image or the bold recipe title and it will open each one in a new tab!!! One-Pot Cheese Italian Pasta and Chicken is a rich and savory dish bursting with your favorite flavors! This simple recipe features a creamy sun-dried tomato sauce that is cooked right into the pasta in this amazing one-pot dish. Toss it all in a pot and let it cook. It's so easy that it just about cooks itself. Now that's my kind of meal!!! 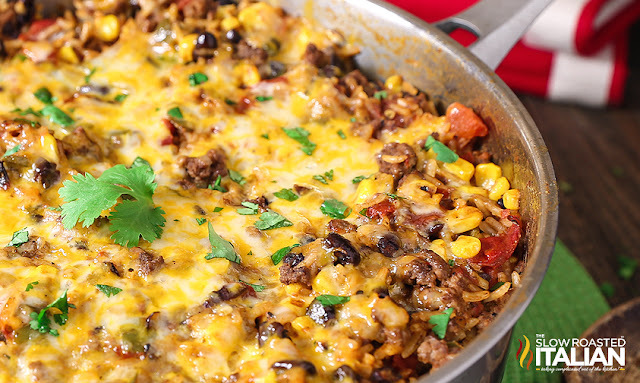 One Skillet Mexican Rice Casserole is a simple recipe that comes together in just 30 minutes. A one pot meal featuring your favorite Mexican flavors that cooks all in one pan. You can't beat that! It is a quick and easy weeknight dinner option with little clean up! 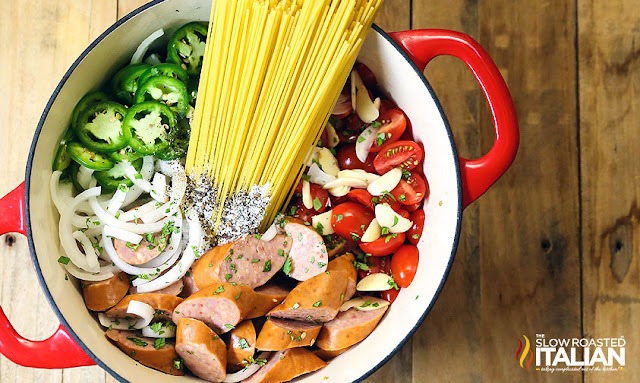 One Pot Mexican Pasta and Sausage features a spectacular salsa inspired sauce; that is cooked right into the spaghetti in this amazing dish, ready in 20 Minutes! Your favorite salsa ingredients come together to with pasta and sausage to create a knock-your-socks-off meal. Toss it all in a pot and let it go. It's so easy, that it just about cooks itself. Now that's my kind of meal! In a wide deep skillet (I love this 4-qt braiser), melt the butter over medium-high heat. Add the garlic and saute until lightly golden. Pour the water, milk, cream, salt, and pepper in the skillet and whisk together. 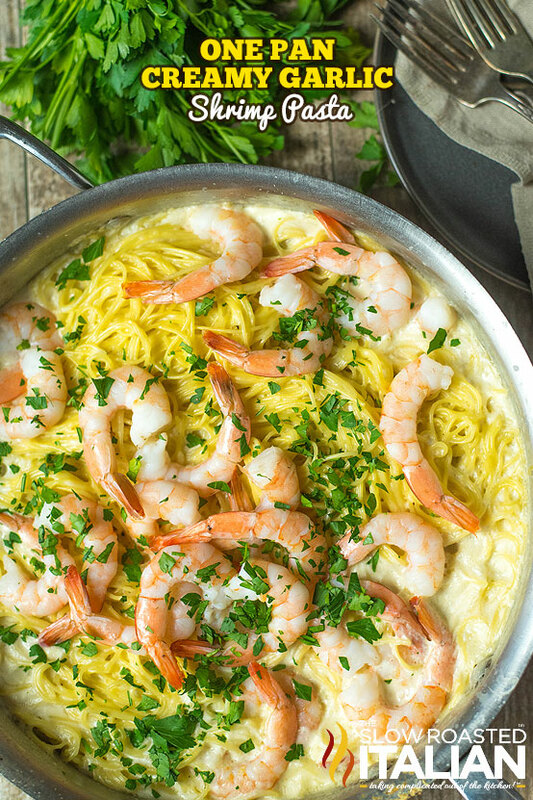 Bring to a simmer, then add in the angel hair pasta. Cover and cook until almost al dente, about 5-7 minutes. Stir in the Parmesan cheese. Top with the shrimp and sprinkle with parsley. Re-cover and simmer for an additional 5 minutes, until shrimp is cooked through, pasta is tender, and sauce is thickened. Serve immediately. This looks delicious! Here's a tip for great taste. During the year I save the peels from shrimp. I put them in the freezer. When I have a fair amount, I put them in a pot of water, cover and cook down for a broth. This stock then goes into my freezer. 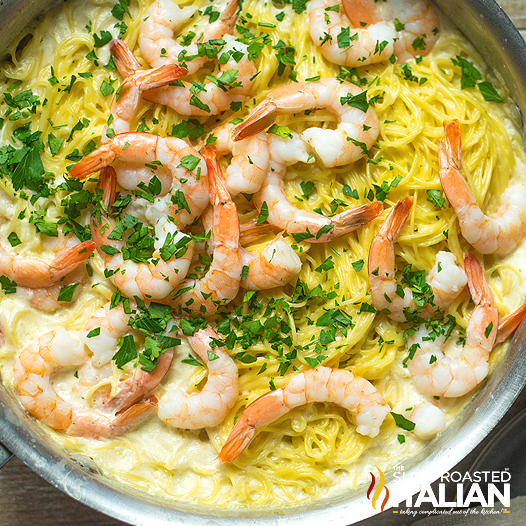 It makes The Best shrimp base for these types of dishes; replacing the water in the recipe. Try it! This looks really good and easy. One of the things that I've noticed is that several recipes I'm finding that call for shrimp don't always say whether they should use raw or cooked shrimp. For those of us that are savvy on these matters read the recipe and figure it out, but there are a lot of beginners out there that go out shopping and buy the wrong shrimp. Just a little heads up. Were those shrimp in the picture actually cooked in the sauce as the recipe states? looks great, I'm going to use all 2 % milk instead of heavy cream..may have to thicken it, but it will really cut down on the calories.